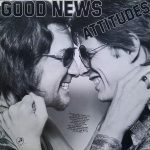 Attitudes was a rock band from Los Angeles consisting of keyboardist David Foster, guitarist Danny Kortchmar, bass guitarist Paul Stallworth and drummer Jim Keltner. Its four members came together while working as session musicians during the recording of George Harrison’s album Extra Texture (Read All About It). One single by the band, “Sweet Summer Music” reached #94 on the Billboard Hot 100 in 1976. James Taylor later covered their single “Honey Don’t Leave L.A.” and that version reached #61 on the Billboard Hot 100 in 1978.